EURUSD continues moving downwards. Possibly, today the price may reach 1.1890 and then grow towards 1.1950, thus forming another consolidation range. If later the instrument breaks this range to the upside, the market may start another correction to reach 1.2150; if to the downside – resume falling towards 1.1840. 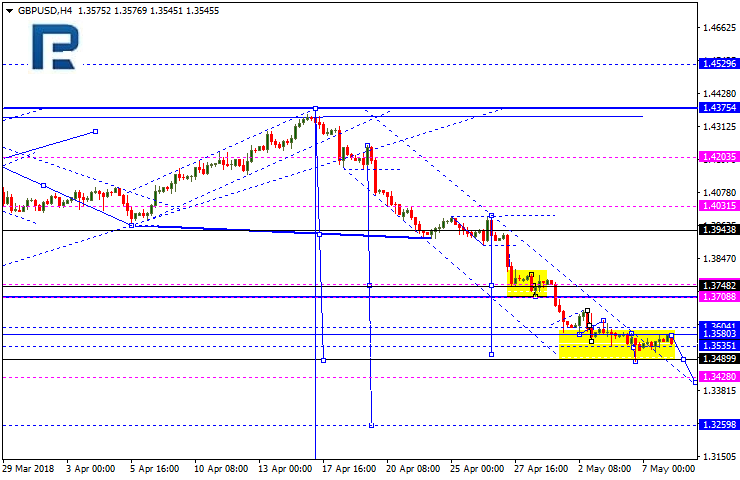 GBPUSD is consolidating near the lows. If later the instrument breaks this range to the upside, the market may start another correction to reach 1.3700; if to the downside – resume falling towards 1.3430. 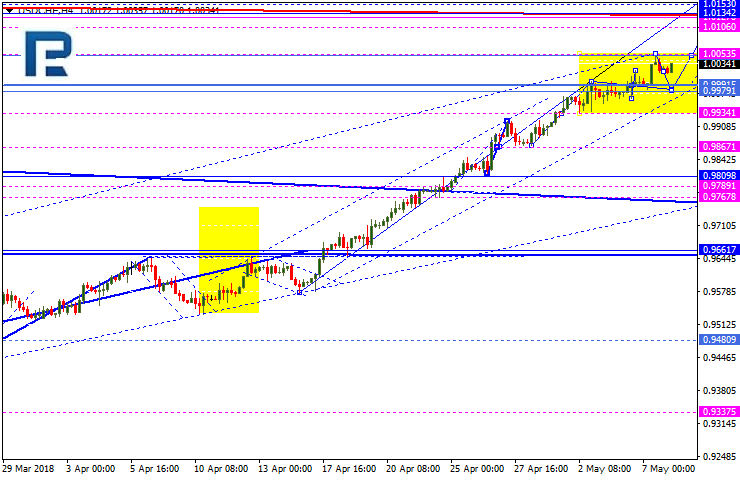 USDCHF is moving upwards. 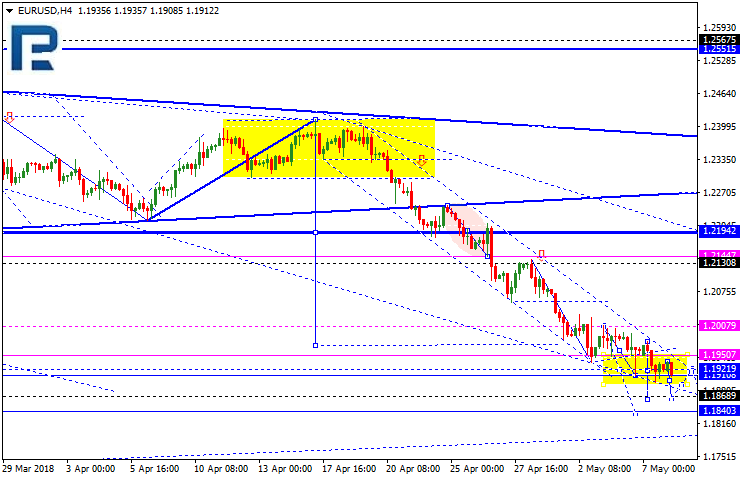 Possibly, today the price may break the range to the upside to reach 1.0106. However, if the range is broken to the downside, the market may fall towards 0.9980 and then start another growth with the target at 1.0106. 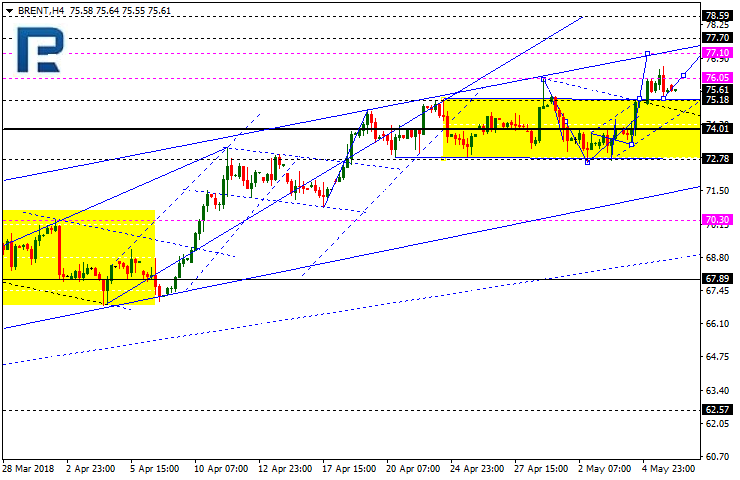 USDJPY is consolidating as well. 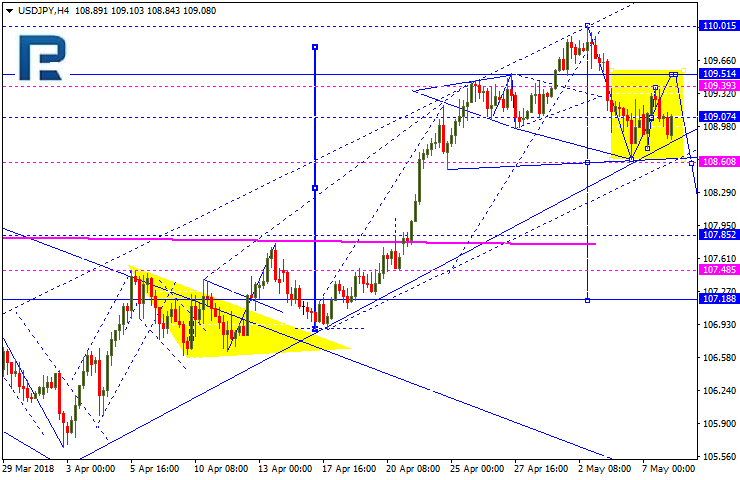 Today, the price may grow towards 109.51, thus forming the Flag pattern. If later the instrument breaks this pattern to the downside, the market may start another decline to reach the short-term target at 107.85; if to the upside – continue growing towards 111.00. 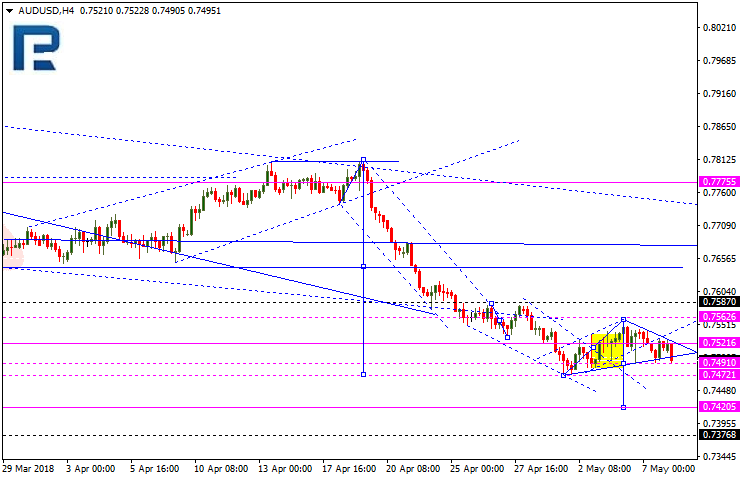 AUDUSD is moving downwards. After breaking 0.7490 to the downside, the instrument may continue falling towards 0.7420 and then start another ascending structure with the target at 0.7560. USDRUB is still moving downwards. 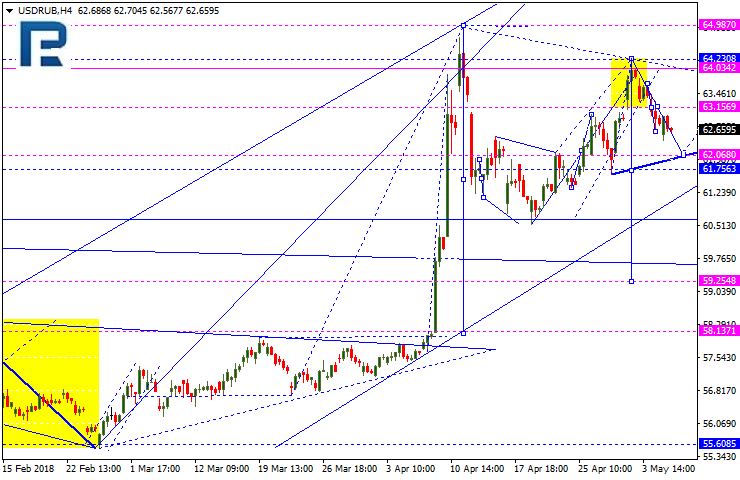 Today, the price may reach the target at 62.20 and then grow towards 63.20. If later the instrument breaks this range to the downside, the market may resume falling towards the short-term target at 60.20; if to the upside – grow to reach 65.00. 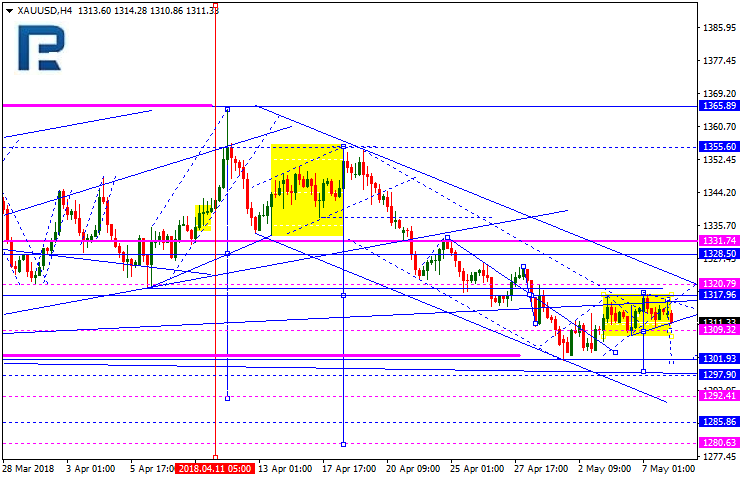 Gold is still consolidating. If later the instrument breaks this range to the downside, the market may resume falling to reach 1297.00; if to the upside – continue the correction towards 1320.00. Brent is still consolidating above 75.20. If later the instrument breaks this range to the upside, the market may resume growing towards 77.70; if to the downside – start another decline to reach 72.80.